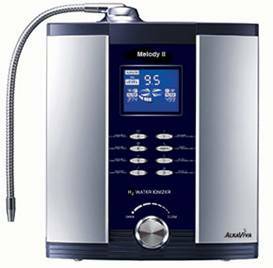 The Melody IIs 13 stages of cutting edge filtration give you healthy water that is pristine clean! The Melody II gives you an ideal balance between of five highly engineered SmartDesign Electrodes, the right amount of power to run them, a great flow rate and solid performance. SmartDesign electrodes are the highest grade platinum and titanium available. The raw materials come from Japan. Fully automatic DARC Cleaning System. Clean with every use. - Keeping your plates clean is essential to getting great H2 performance. We pioneered lasting performance with our DARC cleaning. Ultimate insurance! The Melody IIs Real-time Flow Control System provides you precise control of your flow rate  each and every time you use it. AutoAdjust - With AutoAdjust the power can be adjusted to the optimal level for your water ensuring you get peak H2 performance each and every time you use your Melody II. need to order two filters. This is the same filtration system that came with your ionizer. highest quality carbon. Goes on the RIGHT side of your H2 Series ionizer. LEFT side of your H2 Series ionizer. Call for shipping charges to Alaska, Hawaii, or outside the U.S.